Our “alumni” community scholarship students Leiylo and Kimolo, who both entered the community scholarship program in July 2015, ended up at the top of their class and they were awarded an internship from Tanzania National Parks – an excellent result and very exciting news for them! 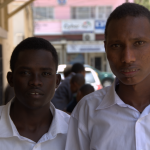 These two students with Maasai roots and a deep understanding of their natural environment, excelled at their course and even offered additional “peer courses” to their fellow students, based on all the real life experience and generation old knowledge they benefitted from. Both students may now qualify for further education, such as a diploma course.